Denise Beam is a light greenish car. A quick ebay search will probably show a picture--I don't have one handy here. Last night I finally found the Gorvette/Lassetire and Francesco/Crew Dude 2-packs at KMart. Glad to be able to stop stopping there. Which one is Denise Beam? Got a pic? The Racing 4 packs are on sale this week at Target so I picked up the one with Denise Beam. 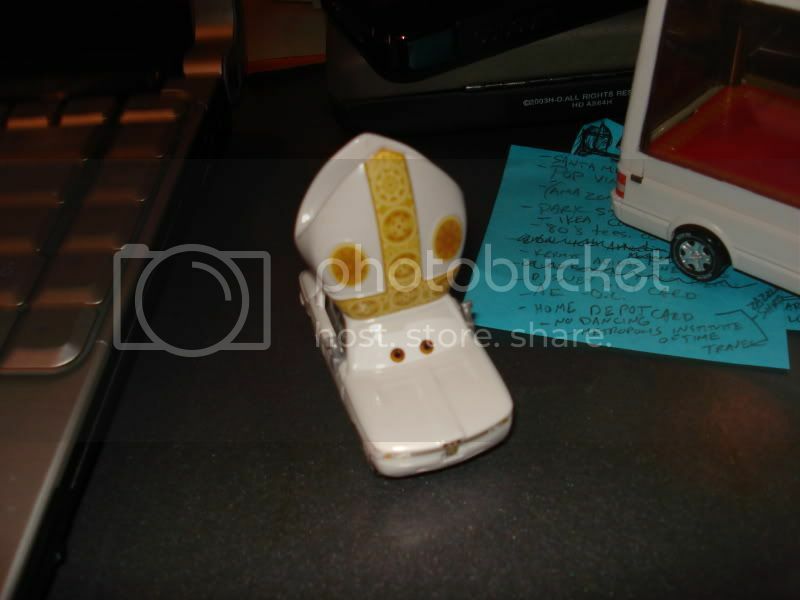 I haven't posted here it a bit, but I did find the Pope and Popemobile at a Target this morning. They also had the 4-pack with Denise Beam. Walmart had the Lewis Hamilton and Carlo Maserati singles too. Found Carlo Masseratii at Toys'R'Us today! I missed single carded Lewis Hamilton by not long. sigh. Cohete, I think "A. Trunkov" is just a typo and is the same car as Petrov Trunkov. Thanks. That's what I was thinking since they're the exact same car with the same expression! He's not even part of the main gang that hangs with Professor Z during the last race. for Cars 1 there was a cool Cars Drive-In Gallery for all the toys... anyone know of one for Cars 2? Nothing like finding both Popemobile and Pope Pinion IV on a sunday! At Wal-Mart as well. What's amazing is that I went to the same store yesterday and found nothing but old stock. Just goes to show, anytime can be a restock day! I also picked up #23 Miguel Camino single card since I never bought his multipacks or launchers. And surprisingly, realized I didn't have ACER in my collection so I bought him as well. Here's a question for you guys. There's a TRU Tokyo pack that has an A. Trunkov. How different is he from the Petrov Trunkov single card? Anyone know? Alright, to get back on the Cars toy discussion, I picked up the boxed set with Ronnie Del Cooper since they're on sale at Target this week. Yoyo, thanks for the photos. But that post it note has too much on it that isn't crossed out. Stop putting all that stuff off! LOL! That's actually my Christmas list! I noticed when I posted last night! WHOA! I need to get that just for fun of it! They only had one, otherwise I would have asked if you wanted one. 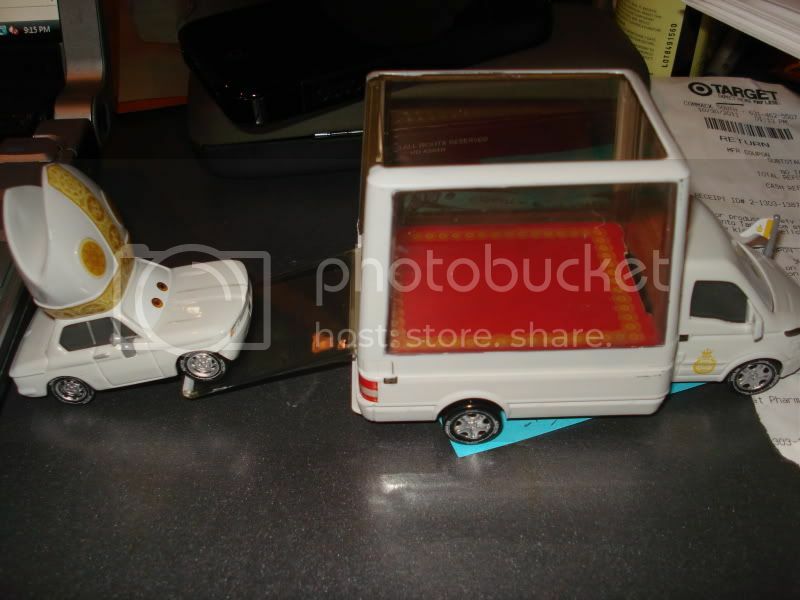 NNL went to Walmart...and got the Pope and Popemobile for me!! 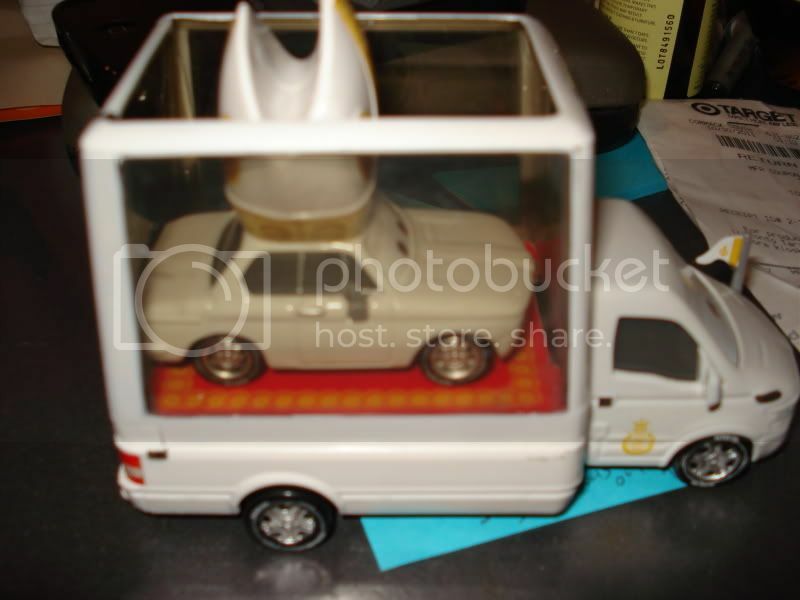 And I definitely need the Pope mobiles. 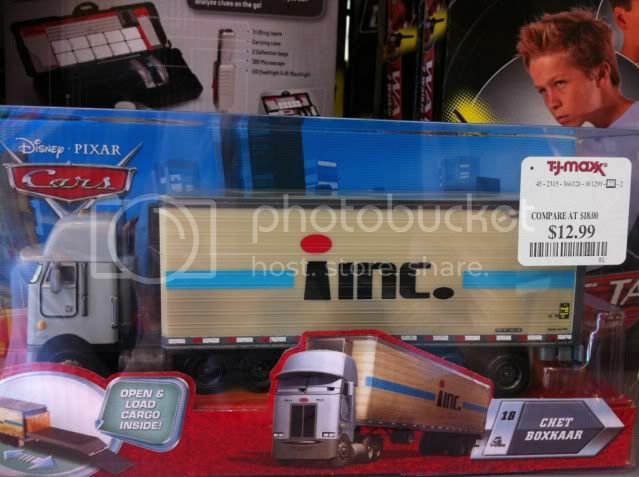 I found the Incredibles hauler at TJ Maxx today! 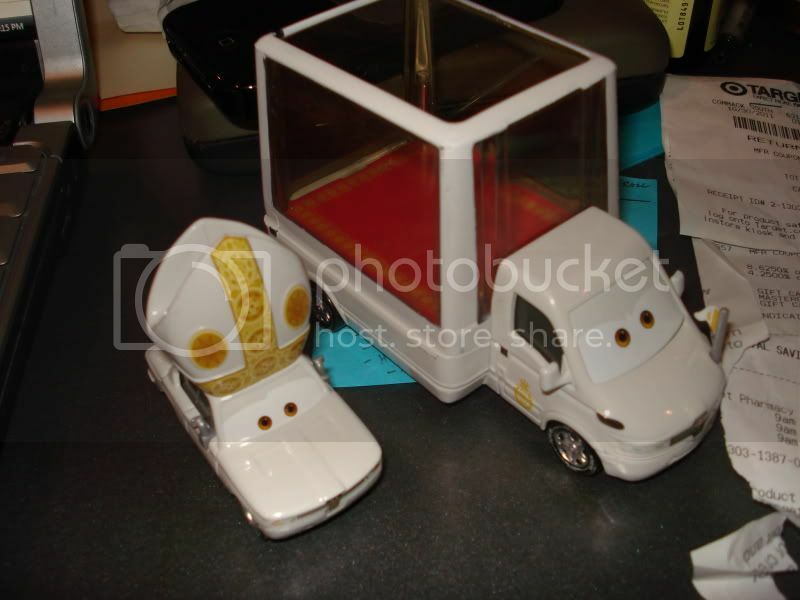 NNL spotted the Popemobile and pope cars in Walmart last week. Didn't pick them up for me though (she was with her parents and didn't want to explain why she was buying them) and haven't seen them since. Not sure I want them 100%, but could have always passed them on to someone here. I got there at 10:40ish and was the second one there. Not as large a turnout as some of the previous K-mart Cars events I've been to. Anyhow, it's nice to finally have a Lewis Hamilton as I held off on buying the launcher and the multipack that he's in. I was the only one there at my Kmart this morning. Kind of surprised me, but then again all these cars have been available in one way or another (except for the wheels, of course). This is my first Miguel Camino, so that was cool. There is another K-mart Cars day this Saturday! Off the top of my head, the rubber tired racers that will be available are Lightning McQueen, Raoul Caroule, Miguel Camino, Lewis Hamilton, Max Schnell, Carla Veloso.